Kirstiekins Blogs: Lazy Days and Mondays // I am cursed. Lazy Days and Mondays // I am cursed. I have been blessed with the curse of being able to read more than one book at a time, and I'm not sure if I love this or if I completely despise it. 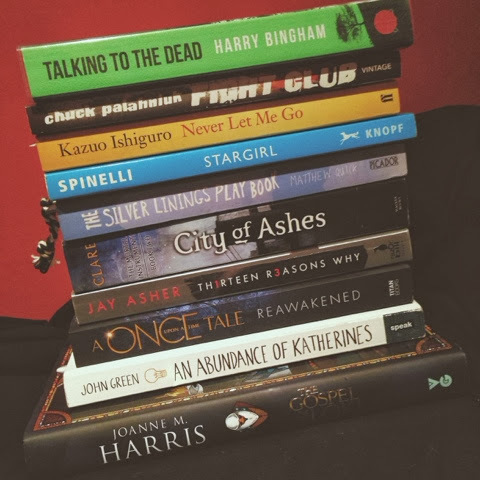 At this precise moment in time I am reading ten books, and I can tell you everything that has happened in each book, without getting the plots, characters, or underlying themes confused with one another. I consider it to be my only useful useless talent, if that makes any sense to you. I can read through the pages of a mooshy romance novel, and then find myself forming a sword out of the words and battling a dragon in another. Surprisingly my brain files away each novel into its own little folder inside my head, and keeps them all very compact, neat, tidy and away from the chaos that has taken over the rest of my brain. I wish my brain was more organised when it came to other aspects of my life, but at the same time, I'm glad that I have a little corner of peace that I can run to, hiding away from the rest of the world. As soon as you open the cover of a book, the only thing that matters is you and the words on the page, the way they speak to you and hold you, letting you feel emotions you didn't even know you had. The ability to read more than one book at a time is something I have grown to love, and although it frustrates me I would never give it up. The fact that I can put a book down, read half of 3 other books, and then come back to it weeks later knowing exactly were I was, and what I was feeling, is something I pride myself on. I have never met another person like this, but I know that I can't be the only one in the world, it's physically impossible. I'm not letting myself read any other books until I finish at least five of the books I am currently reading, which I can guarantee is going to be a challenge in itself.Do you know any good books I should add to my collection? Recommend them to be below, and I'll probably read them at some point.